Alström Syndrome is a rare, genetic disorder described by CH Alström in Sweden in 1959. This section of the website presents a clinical overview of the condition, treatment strategies, a suggested annual review for patients and research both published and underway. Call Dr. Tarek Hiwot on 07979 127826 when seeking medical advice, for example if you are in accident and emergency. You can pass this number on to relevant medical professionals. Don’t put off your vaccinations! The Stay Well This Winter (SWTW) campaign has launched which encourages vulnerable people including people with long-term health conditions and anyone aged over 65 to get the free flu jab. Alström Syndrome specialists also advise that the pneumococcal vaccine should be given every 5 years if you are affected by a complex condition such as Alström Syndrome. The pneumococcal vaccine protects against serious and potentially fatal pneumococcal infections. It’s also known as the “pneumo jab” or pneumonia vaccine. Further information about this vaccine can be found via the NHS website, please click the link below to visit website. Flu is a highly infectious disease and can lead to serious complications if you have a long-term health condition, for example: chronic respiratory disease, such as chronic obstructive pulmonary disease, bronchitis, or emphysema; diabetes; heart, kidney or liver disease; chronic neurological diseases, like multiple sclerosis or cerebral palsy; or have suffered a stroke. People with these and other long-term health conditions are eligible for a free flu jab through their GP or pharmacist. 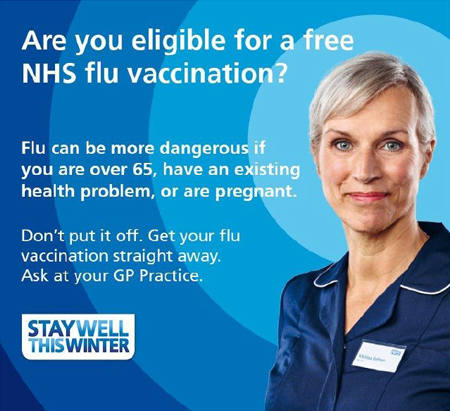 The free vaccine is also offered to other groups at particular risk of infection and complications, anyone aged 65 and over; residents of long-stay care homes; carers; and pregnant women. Children aged 2, 3 and 4 and in school years 1, 2 and 3 are also being offered a free flu vaccination. Those eligible should contact their GP or pharmacist as appropriate, to arrange vaccination. And if you are the main carer of an older or disabled person you may be eligible for the free flu jab, speak to your GP. Visit www.nhs.uk/staywell for more information.